This presentation was delivered in live webinar format in 2016. David’s comments have been edited for clarity and length. In reality, everyone is different. Everyone has different goals, objectives, assets and liabilities. What that means is there really is no one efficient frontier for everyone. One thing that is really important, though, throughout all of this, is the safety of diversification. The only guaranteed alpha that you can create in investing is diversification. That’s why Harry Markowitz won the Nobel Prize for his work for his work back in the 1950s. Diversification is a free lunch. Diversification is very valuable. The idea behind total wealth is that you should diversify your assets. If you have a risk factor in your human capital, you should use your portfolio as a diversifier because it’s your most liquid asset. The moral behind all of this, then, is that there really isn’t one portfolio for everyone. What I don’t expect everyone to do is to build a unique portfolio for every single client; that isn’t operationally feasible. At Morningstar, we work with a number of relatively large 401(k) plans. We decide custom glide paths based upon a lot of these preferences and risk factors. That’s one way to do it. Another way that I think is more realistic for you all is to think about these concepts more holistically. If you have a set of models, maybe create a new set of models, as well, to think about given this investor’s holistic risks, all their information, what is the best portfolio for them given the limited opportunity set of portfolios that you’ve created. In thinking about wealth, a lot of advisors take a mountain approach. They just look at someone’s financial capital. Where someone who is 25 years old has very little, if any, financial wealth. We can define financial wealth as things like financial capital; your 401(k) account, your IRA account, etc. Younger investors have very little financial capital, financial wealth. The goal is as you age, you save money. You save up until you retire, and then you spend it down. The problem is it’s a bit too simplistic. It doesn’t really take into account both sides of the complete equation. What are all the assets that are owned by the investor? What are all the liabilities? When you take this perspective, you reach the conclusion of today’s presentation that no portfolio is an island. That while investor’s wealth is important, it’s only one part of the bigger puzzle. If we think about wealth of the average household collectively, there’s maybe four broad buckets you can think about from the assets perspective. 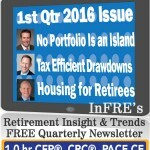 Financial capital: their 401(k) balance, their taxable account; their liquid wealth. Human capital: human capital as the net present value of your future wages. So if you’re 25 years old, you have another 40 years to work; your human capital is a very large asset. Housing wealth: the equity in your home. Do you own a home? If so, what is its value? Pension wealth: Social Security retirement benefits, income of a defined benefit pension plan, an annuity; that guaranteed income you can receive for life from a variety of sources. Collectively, these are your assets. With each asset, there’s also a liability. Your financial capital exists to fund goals like a 529 account to pay for college, buy a boat, save in my 401(k) to fund retirement. Your human capital is largely used to fund consumption. So if you go out every year and you work, and you make $100,000 a year, most of what you make in your job goes for just basic living expenses. It’s paying for your home, your car, your food, your clothes, etc. You usually have a mortgage when you first buy that house. You’ll put 20 percent down, and then that mortgage will obviously disappear over time. Finally is pension wealth; things like Social Security. The liability there is retirement. You accrue this benefit in a defined benefit plan. You use Social Security with the idea being that when you finally retire, you could use this to replace your consumption of the earnings you were making when you were actually working. So these are, again, four main assets to think about. How do they change over someone’s lifetime? Financial capital is very important, but it’s only one piece of this much larger puzzle. When you’re 25 years old, you don’t have anything saved, so all of your wealth is in human capital. You’re going to go out and work for 40 more years, and the net present value of those wages is significant. The goal for most folks is to convert that human capital to other assets over time. For example, you will save for retirement and accumulate financial capital. You will accrue benefits in a defined benefit plan or Social Security. You’ll purchase a home. So that when your human capital is depleted, say at age 65, you have other assets that can provide for you for your remaining lifetime. The key, though, is that financial capital – again – is only one part of this big puzzle. When you build portfolios using things like mean-variance optimization, and you ignore the risks of human capital, pension and real estate, so you really aren’t building efficient portfolios. So what’s a better model? Think about your financial wealth as a tradable portfolio. It’s relatively easy to reallocate your financial wealth in the scheme of things. It is not very easy to reallocate things like human capital, housing wealth or pension wealth. So let’s just say that you’re targeting some kind of hypothetical, total risk level. In this example, we’ll just call it 35 percent stocks and 65 percent bonds. If you have human capital and you’ve got housing wealth and you’ve got pension wealth, how do you invest your financial wealth to make your overall total wealth as efficient as possible? 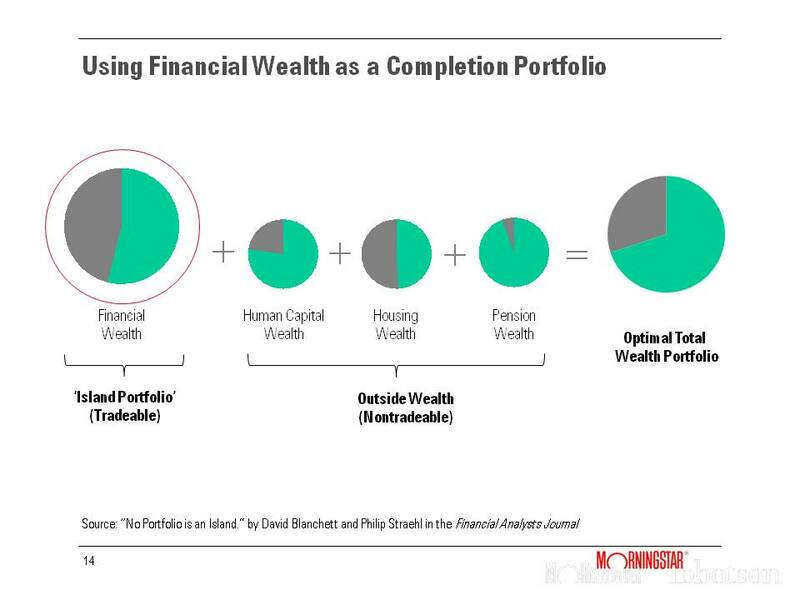 That’s the key: how do you think about wealth holistically to build more efficient portfolios? This affects outcomes in to ways. The most obvious impact is on the equity level. How should the risk of my portfolio change, given the risk of my other assets? If I’ve got, for example, a lot of my wealth in pensions, that means I have a bond-like asset in my non-tradable portfolio so I can be more aggressive in my tradable portfolio. Another example is the asset allocation. For example, if you work in the real estate industry, it might make sense to hold less REITS in your portfolios. There really are different ways this actually impacts what is the optimal portfolio for an investor. How do you build more efficient portfolios? The key here is that you need to change your portfolio based upon how you’re different. We all have different risks. It’s these differences among each investor that kind of provides insight into how we should go about thinking about how my portfolio should differ. One important theory about portfolios in building a more efficient portfolio is human capital. Human capital is this idea that as we age, we deplete this very bond-like asset. Human capital is a relatively safe asset. When you’re relatively young, you have this large allocation to this safe asset so you can be aggressive in your portfolio. As you spend down that safe asset of your human capital, your portfolio should become more conservative, as well, to offset this changing risk. Human capital really is a big deal. Human capital is hands down the largest asset in the world. Becker estimates the value of human capital is at least four times as large as the value of stocks, bonds, housing and all other affects combined. People often ask why human capital matters? An example of this is Enron. Enron was a company where well over a half of the 401(k) was invested in Enron stock. Investing in employer securities is a very bad idea from a diversification perspective. In theory, you shouldn’t have any in it. I understand why you might have some but think about individuals that worked at Enron. They lost their jobs. They lost their retirement savings, and they probably couldn’t sell their homes for a good price because they all lived in neighborhoods around each other. So they had this risk factor that wasn’t diversified at all. The goal behind this research and this line of thought is how do I improve my clients’ and investors’ portfolios through diversification? How Risky are Your Assets? So an important question to ask is how risky are your assets? This is not only human capital, but I think for every asset your client has, you should ask that question; is it a stock or is it a bond? High level, we think about things like pensions. Pensions are just like a bond. They pay this annual coupon every year as long as you’re alive. Human capital is safe. Real estate can be risky or safe; it can be somewhere in the spectrum, especially if you have a mortgage. While residential real estate has been a relatively safe asset, when you apply a five times leverage to the home because you only put 20 percent down, it becomes potentially a very risky asset. How do I think about my risk in terms of my human capital, which is with my job, my house, etc.? Professors, by and large, have relatively safe human capital. Especially if they’re tenured, they have effectively a guaranteed job for as long as they’re alive, or at least until they retire. A realtor, though, is much less safe. They have to go out every day, every month, and every year to sell homes that are subject to things like the market interest rates, what are home prices, etc. The idea behind how risky is your human capital is that a professor can afford to take more risk in their portfolio because they have safer human capital. This can manifest itself in different ways. 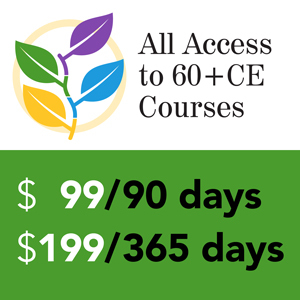 One example is a professor would need to have less in emergency savings. If you’re a realtor, you should probably have at least six months in savings to cover the possibility of losing your job, downturns, etc. A professor can have less. 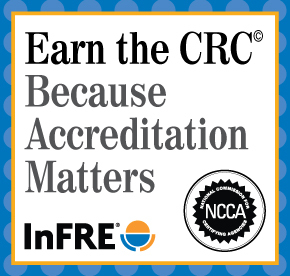 Holistically, the financial capital for a professor can be invested more aggressively than a realtor. It’s a bit more complex than this, though. This idea of total wealth is focused on risk capacity. How much risk can you afford to take, given the risk attributes of your total wealth? There’s also risk preference. We commonly assess risk preferences with a risk tolerance questionnaire. It could be, though, that a professor is an individual who could be more aggressive in their portfolio but they choose not to be because they have a more conservative risk preference. So it’s important to disentangle these two things. The first question is, how much risk can you afford to take, given your total wealth? The second is, what do you prefer to take? When we build portfolio for clients, we figure out this client should have 80 percent of their money in stocks, etc. Risk capacity dominates risk preference. So we first determine how much risk someone should take, given the kind of collective risk of their total wealth, and then we ask them, how do you feel about taking risk? Obviously, preference is important. People are different. Preference towards risk but it isn’t preference that drives risk aversion; it’s risk capacity. Preference is important, but we think that the capacity is more important. How able is an individual to take on risk, given their total wealth versus how do they prefer risk in the scheme of things? An example of this would be buying an annuity. I know that “annuity” is an interesting word to use; people have very different perspectives. But let’s just say that you have a target asset allocation for a target that’s 55 percent bonds and 45 percent stocks. Let’s just say that you as an investor, or one of your clients, wanted to purchase a single premium immediate annuity (SPIA). How should that affect your portfolio? An island perspective on asset allocation, you would tell the client go out and buy that SPIA, and I’ll rebalance your portfolio back to the target. A total wealth perspective would ask the question: what are the risk characteristics of that SPIA? The reality of a SPIA is it’s really just like a bond. It pays this coupon, whether it be monthly or annually, as long as you’re alive. So if you buy a SPIA, you’ve allocated part of your total wealth to fixed income. If you want to maintain a true, risk capacity, total wealth risk level, you would purchase that SPIA from your bond assets and leave the rest of your portfolio alone. After this, your allocation to fixed income would actually decrease from 55 to 40 percent in your portfolio, but your total wealth allocation would be the same. One thing I think that a lot of clients don’t think about when it comes to their portfolios is Social Security. In terms of the largest asset that most clients own when they retire, it’s usually Social Security along with other forms of guaranteed income. Remember, for the average American, Social Security is about 40 to 50 percent of their retirement income. For some, it’s far more. If you have clients that get most of their income from Social Security, they have this incredibly large bond-like asset. It’s important to help them understand that they have this large asset that’s very bond-like; you can be more aggressive in your portfolio. In contrast, if you have a client that has very little guaranteed income, they should be less aggressive in their portfolio because they don’t have this offset through Social Security. So what does all this mean? If you think differently about efficient total wealth portfolios, most of us perceive a two dimensional area for equity allocations; this idea of a glide path, or a glide path that becomes more conservative over time. It can decay at different rates, based upon someone’s risk preference, etc. Most of us have heard of this concept of time diversification; the longer I hold equities, the less risky they become because the distribution of returns converges around the median. This tends to suggest that equities become less risky over time. But the problem is, this isn’t actually a correct depiction of the risk. The longer you hold equities, in reality, they become riskier – not safer. Because the distribution of wealth grows; it doesn’t shrink. So this calls into question, does it actually make sense to hold stocks if you have a longer investment period? If you look at the actual data, the empirical evidence, stocks actually do become less risky over longer time horizons. This actually begs the question, are stocks random? If stock returns are indeed random, time diversification doesn’t exist. There’s no benefit or should be no reason to have a more aggressive portfolio just because you have a longer investment time horizon. The idea of a random walk is based upon this thing called a drunkard’s walk where if you drop a drunk guy off at a bar, where they end up is random, but they should actually come back to the bar. Michael Finke, Wade Pfau and I conducted an analysis where we looked at 20 different countries, because a big problem today with a lot of research is that it works for the U.S. but doesn’t make sense or doesn’t work for other countries. We looked at 20 different countries, with different rolling periods. When we asked the question, does it make sense to have a more aggressive portfolio if you have a longer investment time horizon; the answer was yes across the board. Overwhelmingly, we found that investors that have a longer investment time horizon have a more aggressive portfolio. 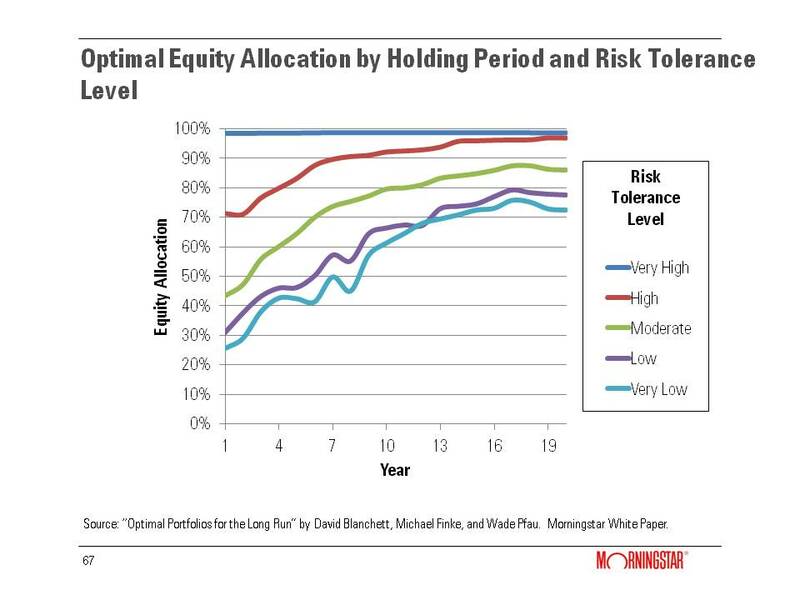 For example on this slide, the light blue line at the bottom, the very low risk tolerance level, if I’m an investor and I’m very risk averse, and I have a one year time investment horizon, I should have a 25 percent-ish allocation to equities. If, however, my investment horizon is 20 years, that same risk averse investor should have a portfolio that’s over 70 percent in stocks. This is significant evidence that suggests that investors should definitely have more aggressive portfolios over longer investment time horizons. We also found that the benefit of being a long term investor is actually increasing. If you can just help your client stay invested, it helps them receive higher long run returns. So what are some parting thoughts? I think the biggest one is that this really provides evidence for bucket systems. First off, buckets are behavioral. The idea behind buckets is to allocate – especially among retirees – monies in different buckets (cash bucket, a portfolio bucket and an annuity bucket) to fund expenses over different periods. Having buckets is totally behavioral. I can create a portfolio and I can cut it into three pieces, to four pieces, to 12 pieces. Buckets themselves have no value from a performance perspective. You can create dynamic or tactical rebalancing rules; all these different rules. Buckets help clients understand how their portfolio is funding their goal, and that may allow them to take on more risk. That’s where buckets add value. Research suggests that it actually makes sense to have buckets, because the longer the time horizon or the investment period, the more aggressive you should be. Another conclusion is there are going to be different efficient frontiers for different clients. I don’t want to suggest that there’s a need to create a custom portfolio for every single client. What it does mean is rethinking this idea of having seven model portfolios, where all your clients have to go into one of these seven portfolios. Because that isn’t going to work or help them best accomplish their goals. Doing this for people is part art and science. People like me may focus more on the science, but understanding clients is critically important to doing this right. 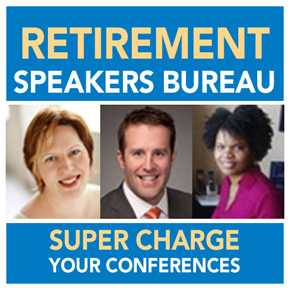 That’s where you come in; that’s where you can help understand your clients, help them determine their goals, help them save for retirement… and then build solutions for them that really help them get there most effectively. 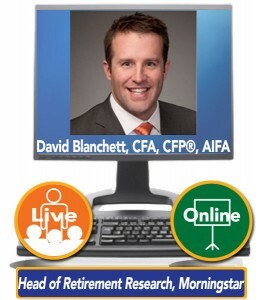 David Blanchett,CFA, CFP®, AIFA® is the head of retirement research for Morningstar Investment Management. In this role, he works to enhance the group’s consulting and investment services. He conducts research primarily in the areas of financial planning, tax planning, annuities, and retirement plans and he serves as the Chairman of the Advice Methodologies investment subcommittee. His research has been published in a variety of academic and industry journals and has been featured in a variety of media publications. His research won the Journal of Financial Planning’s 2007 Financial Frontiers Award, the Retirement Income Industry Association’s 2012 Thought Leadership Award, and the Journal of Financial Planning’s 2014 Montgomery-Warschauer Award. In 2014 Money Magazine named him one of the five brightest minds in retirement and in 2014 Investment News included him in their inaugural 40 under 40 list as a “visionary” for the financial planning industry. 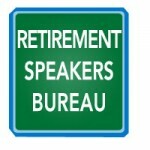 He is a RetireMentor for MarketWatch and an Expert retirement panelist for the Wall Street Journal. He holds a master’s degree in financial services from the American College and a master’s degree in business administration from the University of Chicago Booth School of Business. He is currently taking classes toward a doctorate in personal financial planning at Texas Tech University.